That's what the UK's Car magazine say these spec images are all about. 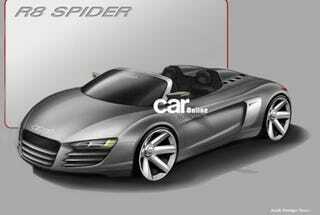 Sketches of the coming R8 Spider and A1 entry hatch were purportedly procured from Audi's Ingolstadt design headquarters. The images show the R8 targa, reportedly as it will appear in 2009, and the A1, Audi's Europe-only answer to the Mini Cooper. Car says the A1 will get Quattro AWD and that spanky new seven-speed DSG we've been hearing about. Click through for A1 action.